Kickin' it pretty good out in the studio. Finished this before I went into work today. 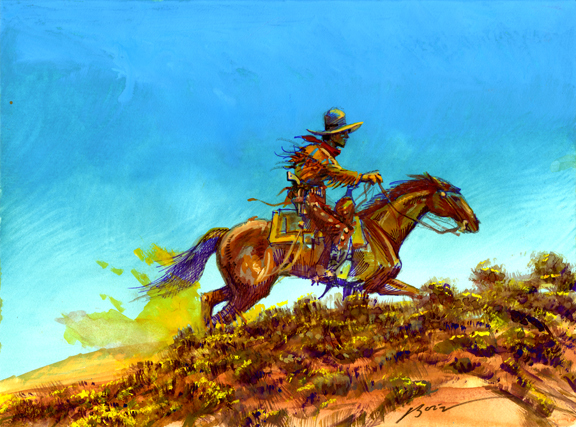 Daily Whip Out: "Pony Express Rider Bustin' Loose On The Northern Slope"
"To be free you need to be willing to sacrifice everything, to be unafraid." Mark Twain's description of seeing a Pony Express rider in Nevada in 1861 while riding on a stage coach: "Here he comes. Away across the endless dead level of the prairie a black speck appears against the sky, and it is plain that it moves. Well, I should think so! In a second or two it becomes a horse and rider, rising and falling, rising and falling - sweeping toward us nearer and nearer - growing more and more distinct, more and more sharply defined - nearer and still nearer, and the flutter of hoofs comes faintly to the ear - another instant a whoop and a hurrah from our upper deck, a wave of the rider's hand, but no reply, and man and horse burst past our excited faces and go swinging away like a belated fragment of a storm."